Gator fans to Mayor: Can we watch the game with you? On the eve of Texas A&M’s first football game as a member of the Southeastern Conference, which also happens to be its season opener, College Station already has begun to welcome fans of the Florida Gators. But five of these Gator fans made it on our radar even before they hit town. Quick history: A few months ago, Florida head football coach Will Muschamp asked members of a Gator booster club if they’d ever been to College Station. If they had, he quipped, it certainly would be their only time. College Station Mayor Nancy Berry recorded a fun video rebuttal — which, incidentally, begins with the Mayor saying, “Howdy, Muschamp!” — and sent the coach a gift basket to show there were no hard feelings. We are a group of five Florida Gators writing you in response to your recent dust-up with Gator Coach Will Muschamp. While we are Gators to our cores and bleed Orange and Blue, we couldn’t help but have a certain admiration for the manner in which you quickly stood up for and defended both your city and your team. We take a boys only road trip each season to cheer on our Gators in the enemy’s den, and this year’s excursion is bringing us to College Station to help welcome the Aggies to the SEC. We have made our travel plans and reserved our rooms at the Hilton College Station Conference Center (arriving September 6th, departing September 9th), but at this point have not been able to secure tickets to the game. That being said, we thought this might provide the perfect opportunity for you to back up your proud words with action. We were wondering if you would be interested in being our hostess for the weekend. It would afford us the opportunity to learn about the histories of College Station and Texas A&M from someone well-versed in both, in addition to giving us an unforgettable story to relate when we talk about this year’s trip in the future. We suspect that watching the game with you would be even more entertaining than being in our usual seats in the Gator section of the stadium reserved for us by the home team (i.e. nosebleeds). Rest assured we are not a group of drunken louts looking to cause trouble with everyone wearing different colors than us. We are all proud Gators and respected professionals in our hometown of Fort Myers, Florida. We look forward to our road trips each year, and respect the fact that students and graduates of the schools we visit have a pride in their university that rivals the pride we have in the University of Florida. We look forward to your reply and hope to have the chance to spend time with you on the weekend of September 8th. Mayor Berry thanked Ted for his e-mail, but assured him that she had no special connections to score tickets for his group. 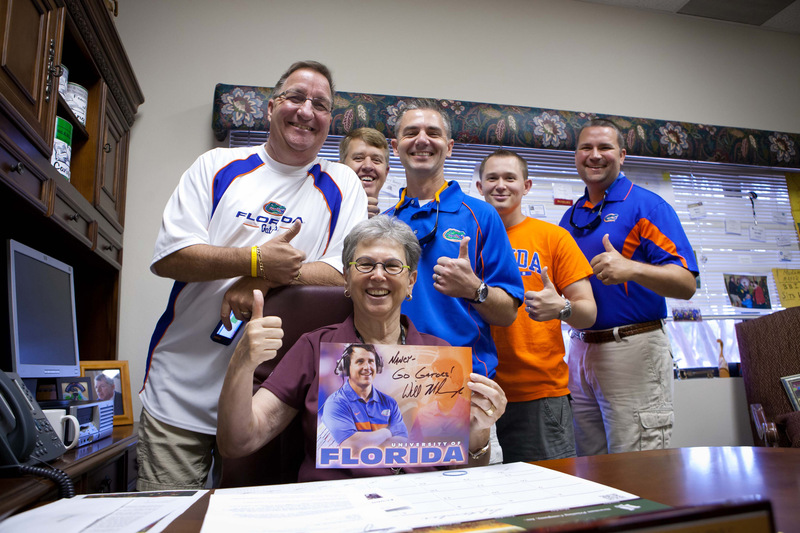 Nevertheless, she invited these bold Gators to come visit her at College Station City Hall, and they did Friday morning. They proved to be a fun and enthusiastic group of guys, who all agreed they’ve been welcomed to town with open arms. Ted assured me that he’s not in the habit of asking mayors of visiting teams’ cities for tickets. Here’s a reminder for all the Gators and Aggies who plan to attend the big event: These maps should help you travel to and from Kyle Field on Saturday. This entry was posted on September 7, 2012 by City of College Station. It was filed under City Council, Public Communications and was tagged with Aggie football, Muschamp, Nancy Berry. These guys sound like some fun people and I hope they enjoy their stay in Aggieland !